From 1964-1966, Roger Blobaum served as a press secretary and legislative assistant to U.S. Senator Gaylord Nelson (D-Wisconsin.) Documents relate to work developing and promoting legislation to ban the manufacture of DDT, a new conservation title that was included in the 1965 farm bill and some text of pesticide issue interviews of Senator Nelson. Mr. NELSON. Mr. President, I now introduce, for appropriate reference, a bill to ban the manufacture of DDT for any use in this country. 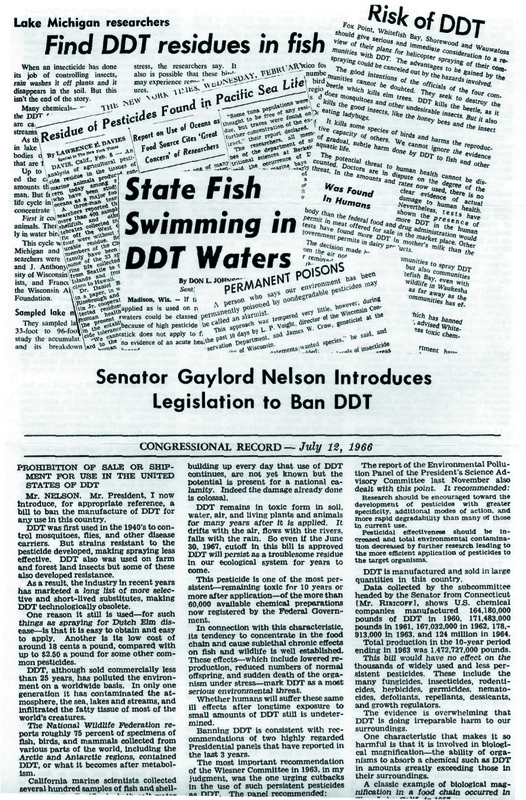 WASHINGTON, D.C. — Senator Gaylord Nelson has urged the U. S. Department of Agriculture to stop recommending DDT for use by home gardeners, farmers, and others in combating insect pests. STATEMENT OF SENATOR GAYLORD NELSON TO SENATE AGRICULTURE COMMITTEE ON S. 1702, A BILL FOR A LONG-TERM CROPLAND ADJUSTMENT PROGRAM TO ASSIST PRODU­CERS IN DIVERTING CROPLAND TO CONSERVATION USES, AND FOR OTHER PURPOSES.